Castrol EDGE is Castrol’s most advanced engine oil. It is a premium full synthetic oil that is designed for consumers who demand the best performance from their cars. 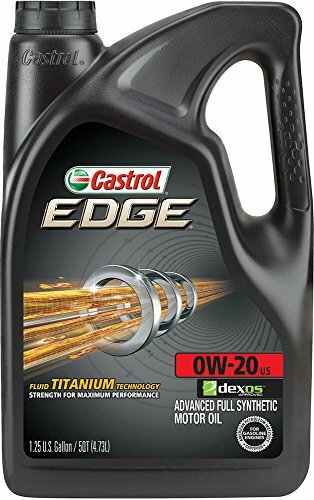 Castrol EDGE is recommended by leading car manufacturers. Castrol EDGE is engineered with fluid titanium technology that physically changes the way the oil behaves under pressure. As a result of increased demand for performance and fuel economy, pressures in today’s engines have almost doubled over the last three decades. Greater pressure means more stress for the oil and the potential for more friction. As metal to metal contact increases, it causes wear and reduces performance. Underneath the hood, the pressure can reach 10 tons per square centimeter. That’s like five cars resting on a high heel relying only on a micro thin layer of oil for protection. So you need a strong oil to reduce friction, and to help increase horsepower and fuel economy. To combat the increased pressures faced in today’s engines, Castrol EDGE is engineered with fluid titanium technology that physically changes the way the oil behaves under pressure. Castrol’s patented titanium technology provides documented performance in friction reduction, anti-wear and deposit control protection. The titanium-based technology ensures performance and strength.